1 of 1 Heat oven to 375 degrees F. Line one 12-cup cupcake pan with foil or paper cupcake liners. 1 of 2 In medium-size bowl, combine flour, baking powder and salt. In large bowl, beat butter with an electric mixer until smooth. Add sugar and beat until pale and fluffy, about 2 minutes. Beat in eggs, one at a time. On low speed, add half the flour mixture. Beat in the milk and vanilla, followed by remaining flour mixture. Fold in fresh blueberries. 2 of 2 Spoon batter into pan, a scant 1/3 cup in each indent. Bake at 375 degrees F for 23 to 25 minutes, turning pan once. Cool in pan on wire rack, then remove cakes from pan to cool completely. 1 of 1 In large bowl, combine cream and granulated sugar. Beat until medium-stiff peaks are formed. Spoon onto cooled cupcakes, about 1/4 cup on each. 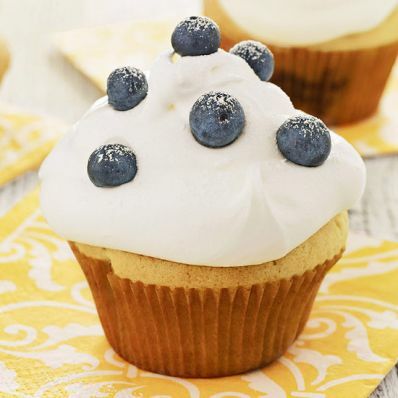 Scatter 6 or 7 blueberries over each cupcake, and dust with a little confectioners sugar, if desired. Serve immediately or keep cool until serving.